Good food, enhanced and accompanied with honest wine – what could be better? The culinary arts have long played and important role in the Pannonian region. Born as the daughter of restaurateurs, Birgit grew up with a passion for gastronomy. Together with her brother Paul and sister-in-law Alexandra from Restaurant Paulis Stuben, she tastes her wines combined with modern interpretations of traditional Burgenland dishes. Good for the body and soul, tasted with passion and attentiveness. 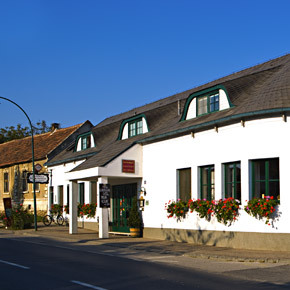 Known by Purbach natives as “Paulis Stuben”, Weingasthof Braunstein is the place where locals and numerous regular guests from near and far meet. This is by no means a coincidence. It is our pleasure to serve regional specialties of highest standards in a friendly, cosy atmosphere. Local Burgenland products are prepared deliciously according to traditional recipes. Breakfast from 8 to 10:30.